Because of continuing research, the structure of the Y-DNA Haplogroup Tree changes and ISOGG does its best to keep the tree updated with the latest developments in the field. The viewer may observe other versions of the tree on the Web. Email Ray H. Banks if the differences need clarification or if you find any broken links on this page. Link to Experimental Composite Y-DNA Tree by Ray Banks. M1205, L405/PF5990 may comprise a new MP or MPS subgroup. Listed 30 March 2014. The SNPs defining Haplogroup H were changed on 24 February 2014. See Magoon et al (2013). The following haplogroups are contained within Haplogroup K: LT, L, T, NO, N, O, S, M, P. See Haplogroup K for their relative positions. Listed 15 October 2014. To see the subclades and their SNPs, click on the haplogroup name. Prior versions of the tree included separate lines as placeholders for paragroups, denoted with an asterisk. Paragroups are lineages within a haplogroup that are not defined by any additional markers. (1) These placeholders have been removed to simplify the display of SNPs. (1) Wikipedia's explanation of Paragroups. Listed 1 August 2015. The root of the Y haplogroup tree is the so-called "Y-Chromosome Adam," the most recent patrineal ancestor of all people living today, who is believed to have lived 60,000 to 90,000 years ago. He was not the only man living at that time, he simply was the only man with an unbroken male line of descent to the present day. The A haplogroup is thought to have been defined about 60,000 years bp. The BT haplogroup split from the root of the Y haplogroup tree 55,000 years before present (bp), probably in North East Africa. The CF(xDE) haplogroup was the common ancestor of all people who migrated outside of Africa until recent times. The defining mutation occurred 31-55,000 years bp in North East Africa and is still most common in Africa today in Ethiopia and Sudan. The DE haplogroup appeared approximately 50,000 years bp in North East Africa and subsequently split into haplogroup E that spread to Europe and Africa and haplogroup D that rapidly spread along the coastline of India and Asia to North Asia. The IJ haplogroup characterizes part of the second wave of emigration from Africa that occurred via the Middle East 45,000 years bp and defines two branches I and J that emigrated northwards and eastwards into Europe. The J branch subsequently split again and contributed to the current North African population. The NO haplogroup appeared approximately 35,000-40,000 years bp in a region east of the Aral sea; subsequent branches spread to North Asia (N) and another branch (O) to South Asia via North India. Batini et al, Large-scale Recent Expansion of European Patrilineages Shown by Population Resequencing. Nature Communications, 19 May 2015. Karafet et al, Improved Phylogenetic Resolution and Rapid Diversification of Y-chromosome Haplogroup K-M526 in Southeast Asia. European Journal of Human Genetics, 1-5, 2014. Magoon et al, Generation of High-resolution a priori Y-chromosome Phylogenies Using "Next-generation" Sequencing Data bioRxiv, doi: 10.1101/000802, December 13, 2013. Wang et al, Discovery of Phylogenetic Relevant Y-chromosome Variants in 1000 Genomes Project Data. Quantitative Biology, arXiv:1310.6590, 2013. Added Hallast et al (2014) on 24 January 2015. Added F3402, Z12093 on 28 January 2015. Added Karmin et al (2015) on 3 April 2015. Moved PF5528, PF5532, PF5539, PF5554, PF5557, PF5563, PF5564, PF5583, PF5689, PF5692, PF5693, PF5699, PF5705, PF5715, PF5717, PF5720, PF5723, PF5729, PF5737, PF5743, PF5747, PF5754, PF5756, PF5757, PF5771, PF5773, PF5779, PF5790, PF5791, PF5804, PF5810, PF5813, PF5815, PF5821, PF5823, PF5829, PF5830, PF5832, PF5833, PF5839 from L Investigation to tree on 3 April 2015. Added F549/M2335/S22380, CTS11667 to tree; moved F650/M2346, M2308/Z4842, M2313/Z4858, M2339/Z4952, Z12176, Z12216 from Investigation to tree on 14 July 2015. Added dual names to some tree items to improve clarity involving haplogroup K on 26 November 2015. 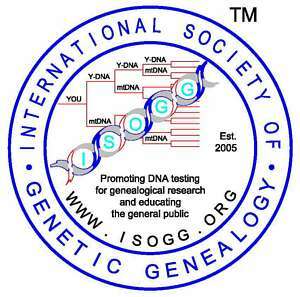 Copyright 2015. International Society of Genetic Genealogy. All Rights Reserved.